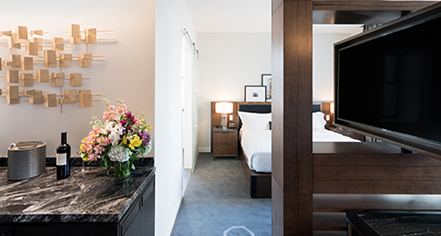 Beautifully decorated and well-equipped with everything needed to relax and stay productive, all guestrooms feature a plush bed dressed in luxurious linens to guarantee a great night’s sleep. Enjoy movies and favorite television shows on the 55-inch LED HDTV, and stay connected through complimentary WiFi. 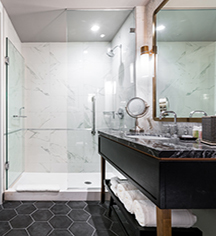 Refresh in the elegant bath which features exclusive toiletries and soft plush towels. Vista guestrooms feature floor-to-ceiling windows for stunning views of the Chicago River. Ample suites have a separate sitting area with pull-out sofa. Accessible rooms are specially designed for guests that require additional space and amenities. All accessible rooms feature a roll-in shower, wider hallways, and an ADA approved doorbell.